Other uses for you diaper sprayer! You may wonder if investing the money in a diaper sprayer is worth it. As mom who has cloth diapered with and without a sprayer, I say yes! Of course, cloth diapering can be done without one. Many parents have successfully cloth diapered multiple children without access to a diaper sprayer. Sprayers do make things easier and the cost over time is minimal! So what do you do when your child is potty trained and you don't need to spray your diapers anymore? Here's some ideas! Bathroom clean-up: I love using our sprayer to clean the shower! It cuts time and makes it so much easier! Vomit: If the flu or stomach bug is running the rounds in your house, the diaper sprayer comes in handy spraying vomit off of clothing or linens. Just flush it away! Potty training: When accidents happen, use the sprayer just like you would on a diaper. It's also great for spraying out potty seats! Pet baths: If you need to bath your pet in the bathtub, use the diaper sprayer to rinse them off! Laundry: Need to treat a stain or get something out of a heavily soiled article of clothing? Use the sprayer! Mama Cloth: Rinse your mama cloth out with your sprayer! 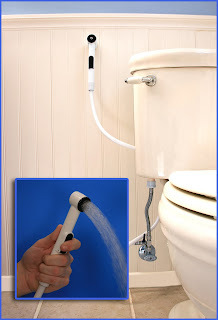 Bidet: Not quite like the real thing, but better than nothing! What other uses can you come up with? Just be sure your kids know it is not for indoor water fights! Great article. I had my husband install one when I was 8 months pregnant. I can't tell you how wonderful it was (personally) postpartum in those first couple of weeks of healing. If anyone had asked me if I preferred the sprayer over my sitz bath, I would have told them the sprayer hands down. Knickernappies is owned and operated by the Hicks family and based in Springfield, Oregon. Both Heather and Shannon work from home managing the business while caring for their three children. Julie Clark, also known as The Cloth Diaper Geek, manages Knickernappies social media and marketing needs and is our primary blog contributor. Interested in writing articles for the Knickernappies Blog? Contact us! We'll email you the details on how you can earn free diapers and accessories by contributing article to the Knickernappies Blog! Do you love KnickerNappies? Grab the code and place our button on your Blog or Website. Thanks!